Now called the Seed Stitcher, the former Grass Stitcher Lawn Repair Tool you can inexpensively repair bare spots to your lawn quickly and easily. Seed Stitcher is the first and only hand tool for fast, effective lawn repairs. This sturdy tool delivers a return on your investment every time you use it. Your only other expense is seed and starter fertilizer. This makes the Seed Stitcher Lawn Repair much less expensive than any other method. Currently only the single seed stitcher tool is available. Plant alternative ground covers or wildflowers from seed in no time. Just stitch, seed and sprinkle! One for hard ground, one for soft lets you get the job done anywhere. 1. Perforate the troubled spot directly through the dead grass with the Seed Stitcher, leaving the dead grass in place. Then you spread seed over the perforations and water. 2. Apply downward pressure to the wheels using either body weight with the horizontal handle or the footpad while rocking the wheel back and forth over the damaged lawn area. Make sure not to extend the Grass Stitcher too far out in front of you as this will make it difficult to use and decrease critical planting depth. Use small concise strokes back and forth no more than 12 inches per stroke for best results. 3. If the soil is hard, slide up the horizontal handle and use the footpad to apply pressure while rocking the wheels back and forth with your leg. 4. If the soil is soft, slide down the horizontal handle applying body weight to the horizontal handle while rocking the wheels back and forth for even quicker repairs. People everywhere are turning to organic lawn care to ensure a healthier environment. The Seed Stitcher is the perfect tool to create a healthy, safe and beautiful lawn-free of chemicals. Don't waste money and time on ineffective patch gimmicks. Most seeding failures result from inadequate moisture or improper planting depth. Have you ever sprinkled one of those messy bagged patch materials (as seen on TV), only to see some of it germinate then whither away? This happens because poor soil/seed contact results in the seed drying out. If the seed does happen to germinate, it will never penetrate the hard soil below and will eventually fail. This tool eliminates all these obstacles for successful repairs every time. So don't fall for those so-called easy solutions in a bag. Choose the method that really works every time. Want to rid your lawn of crabgrass forever? Break the crabgrass cycle. Just stitch, seed and sprinkle directly through it, and watch your grass overgrow that unsightly crabgrass. The Seed Stitcher gives you an easy way to deal with that unsightly crabgrass this fall so it won't emerge again next year. You don't need chemicals, and you don't even need to pull out the crabgrass. Just stitch, seed and sprinkle directly through the crabgrass. Because crabgrass is an annual weed, it will die off at the first frost, and the new grass will grow directly through the old dead crabgrass. The new grass will shade out the crabgrass seeds so they won't germinate next year to infest your lawn again. 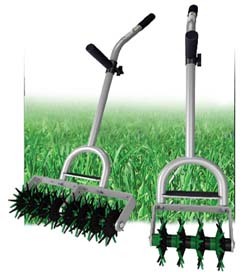 Finally you can end the annoying crabgrass cycle with the former Grass Stitcher.